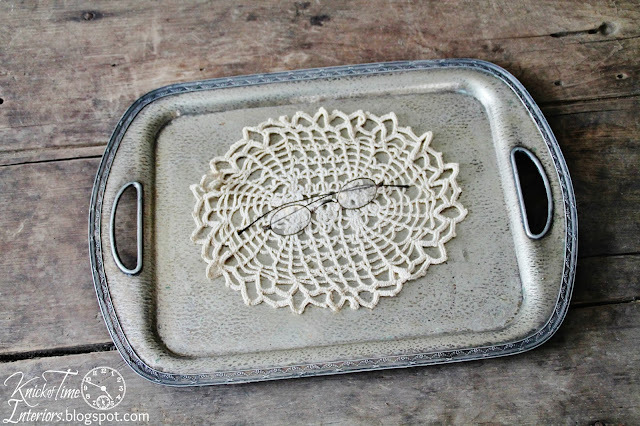 With Christmas last week, I didn’t create many new things, but I did quite a few fun finds on Saturday when I visited one of my favorite thrift stores. I’ve never seen this game before, but it’s a Sentence Cube Game from 1971, made by the Scrabble company. 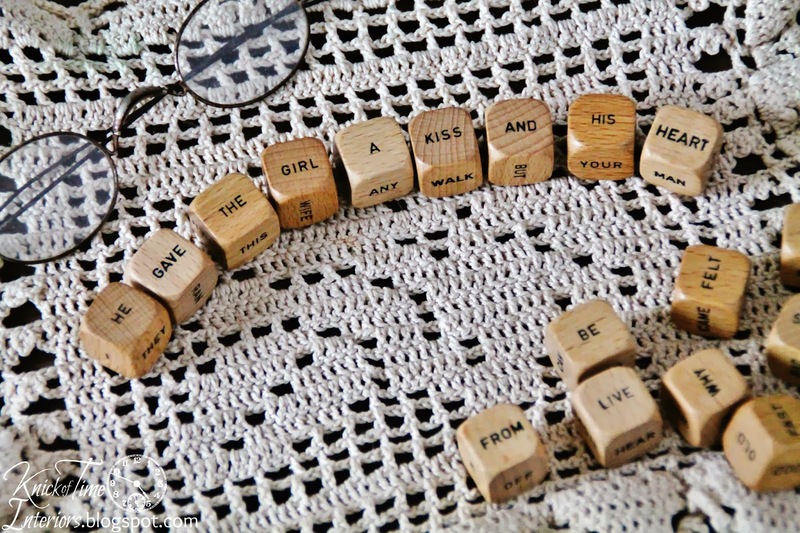 It has 21 wooden cubes which players try to form sentences with before the sand in the included time runs out. I’m going to try to take my kids into playing it with me a few times before it sells! It’s available here. 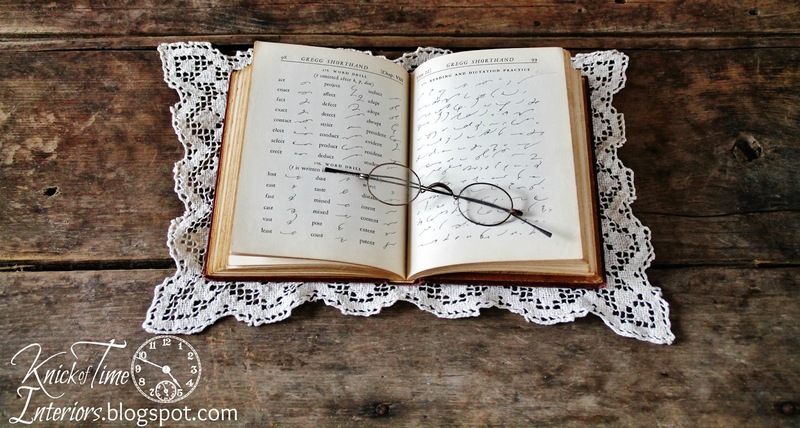 Did you take shorthand in high school? I didn’t, but wish I had. I love the way it looks. One of my Facebook followers commented that she uses it to write her Christmas gift list, so her family can’t read it. Such a great idea! This sold within minutes of listing it, so it is not available. How about old drawers? Do you use the in your house? I can’t resist buying them whenever I find stray ones in thrift stores and at auctions. They make a fun base for a vignette, but are useful for holding books, magazines, games and remote controls on the coffee table. This old oak drawer has the original pretty pull on it. Someone replaced the bottom of the drawer with new wood at some point. It’s available here. Old cooking pots are another thing I rarely pass up when I come across them. 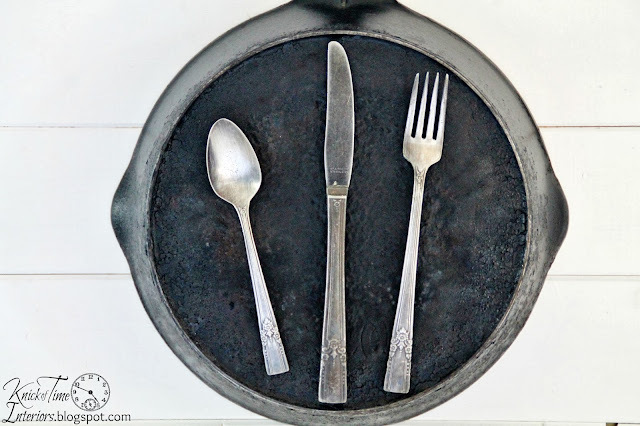 I use several old ones to cook in, but I love using them as portable storage as well. This one is available here. This one has already sold, but I got it at the same thrift store. I love this thrift store, because it’s crammed to the rafters with stuff and isn’t really organized well at all, but that makes rooting and rummaging around for great finds that much more fun. The owner always says I manage to find things she didn’t even know she had. 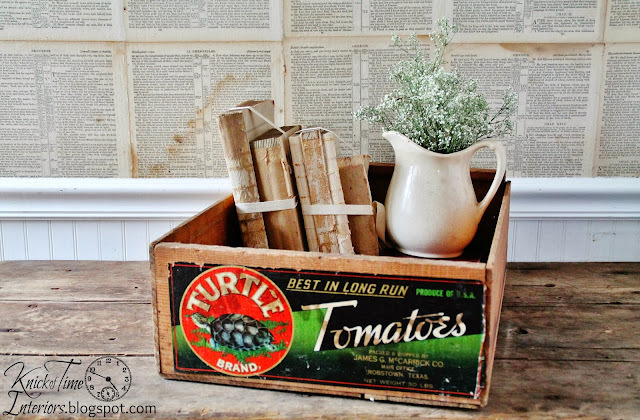 I had to dig this old produce create out from behind plastic totes filled with old fabric. It’s available here. I love the colors and emblem on these All American Lead Shot bags. 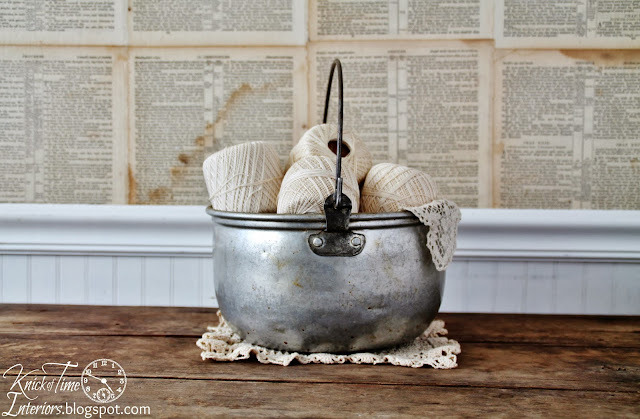 I like use the as “sleeves” over canning jars for vases. 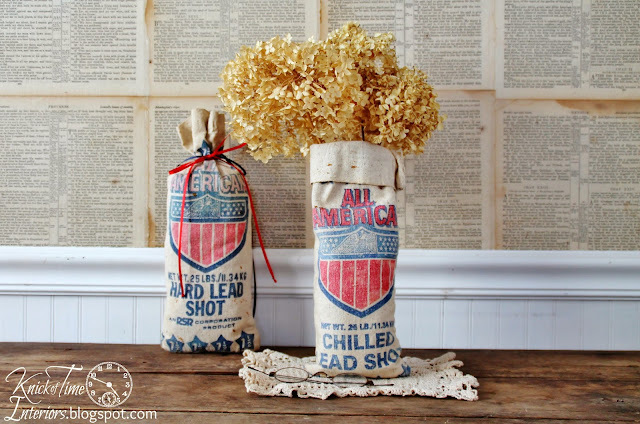 These will make wonderful July 4th decor. The set of 2 are available here. I got this cute little tricycle at an auction a few weeks ago. 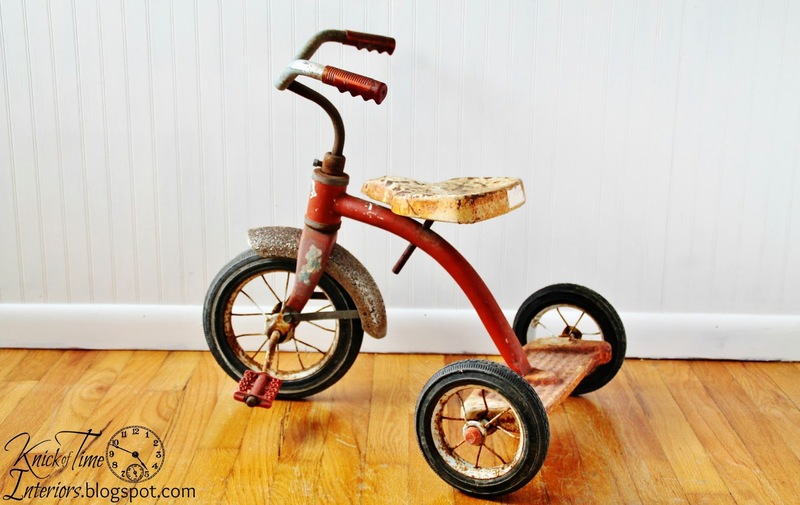 It’s a toddler size trike, so it’s small enough to be used as indoor or outdoor decor, although it’s still sturdy enough to ride. It’s available here. 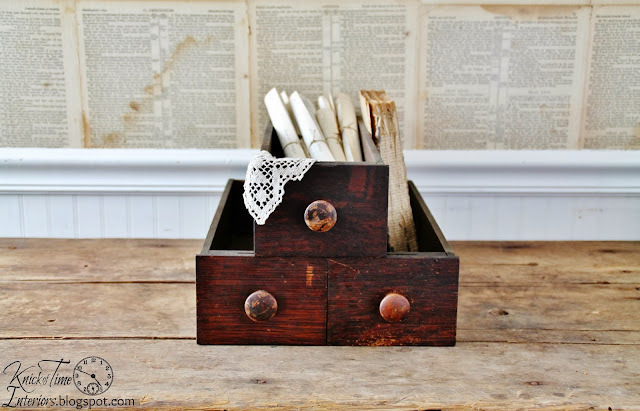 At the same auction, I got an antique sewing machine and stand, but the stand was badly damaged, with missing parts, so I’m creating new projects with some of the parts, but this set of 3 drawers is available here. Like the drawer shown above, I like to use sewing drawers as spice racks or to hold remote controls – or just display them with books, feathers and other little collections in. I found 2 antique dust pans in a thrift store a few weeks ago. They make adorable magnet boards. The mint green one has sold, but the silver one is available here. 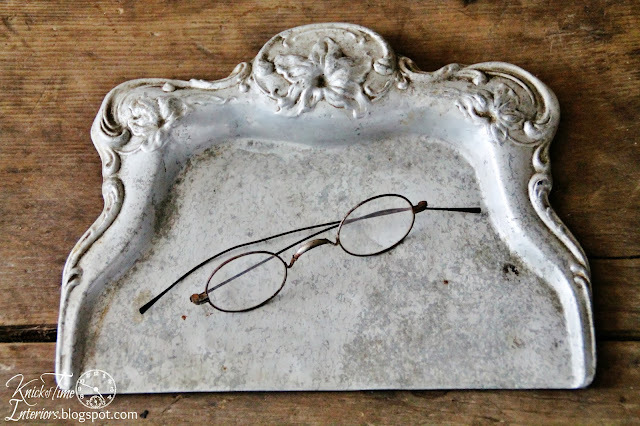 I couldn’t pass up the patina on this silver serving tray – especially they way it has darkened up inside the details around the edges. 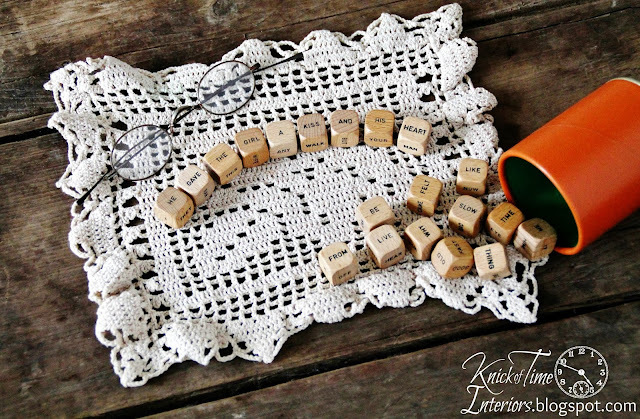 These are perfect to use on a coffee table, but look pretty sitting on the kitchen table to hold salt and pepper shakers and napkins. It’s available here. 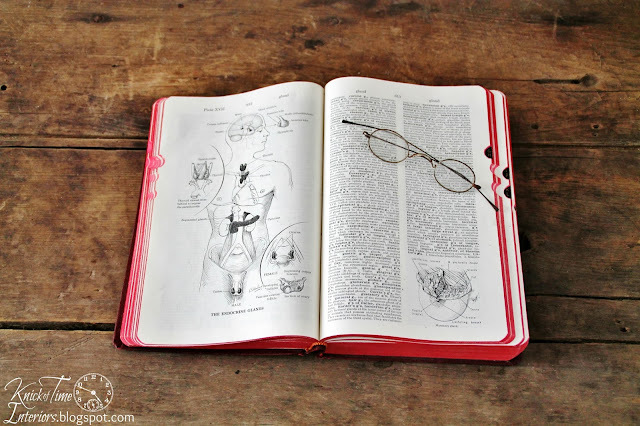 I love finding old medical dictionaries – they always have the most interesting illustrations in them. This one has sold. This Vintage Soul sign was one of the few projects I completed recently. It has sold, but I can create another like it, as I still have another curved wood piece like it, so let me know if you’d like me to make one for you. Several weeks ago, I bought a big box full of antique tarnished silverware, which I never pass up if I find some reasonably priced. 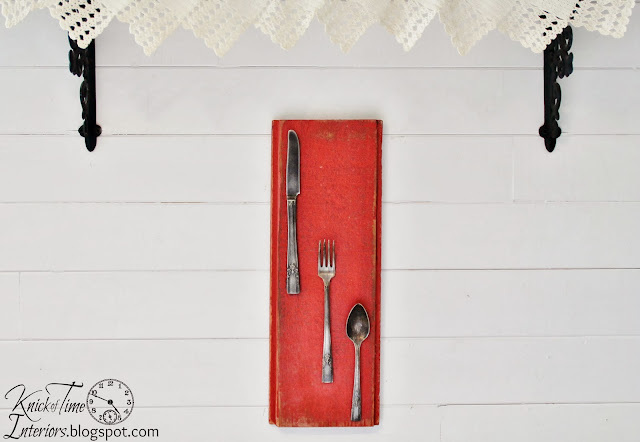 I attached a knife, fork and spoon set on a painted old board for a wall display. It’s available here. A while back, I made another “Fine Dining” sign this is available here. I decided to turn some of the silverware into magnets to use on the refrigerator. I have several of this style sets available here. The butter knife and soup spoon set is available here. I’m looking forward to going to another auction with my husband this week and hope the weather won’t be terribly frigid. Last time, my toes nearly froze off! Hopefully, I have some great finds to share with you next week. Fantastic finds Angie. 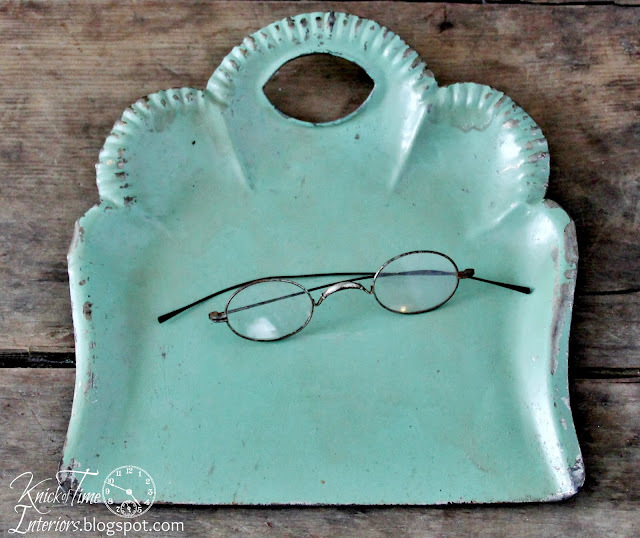 I’m especially in love with the mint dust pan. 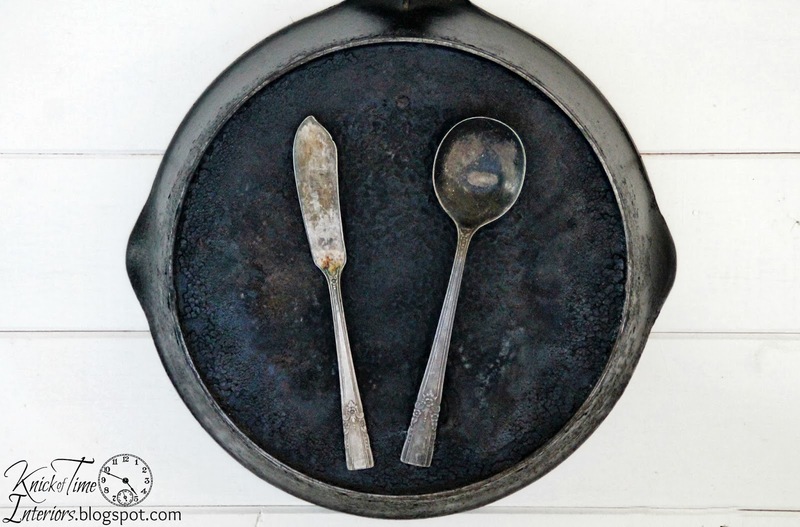 Love those old cooking pots Angie. 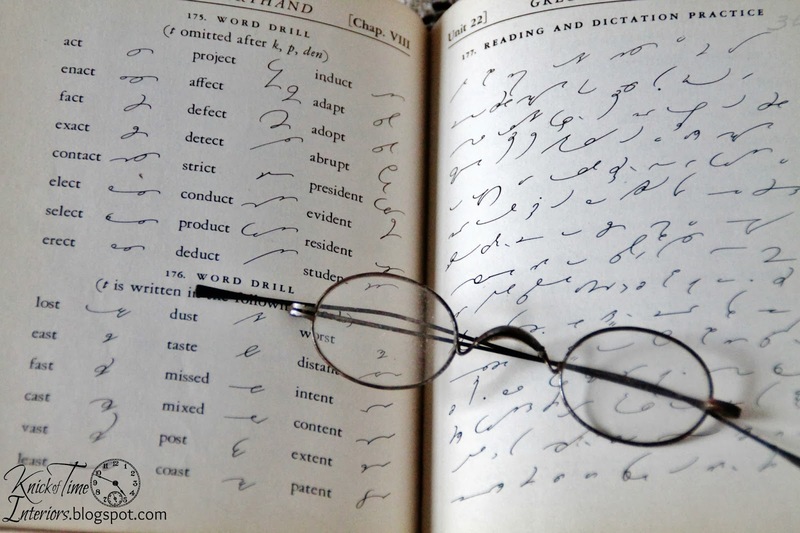 I took shorthand and hope I still have my book somewhere, but really doubtful. Have one box of papers in the attic and maybe it is there. You are so creative with your great finds. I went to WV with my husband this weekend to visit his family and passed by many a junk store and old abandoned buildings & houses, every single one I passed I thought of you and the treasures that must be hidden inside! I wondered how much of some of those old houses could be re-purposed into something fabulous by your wonderful talent! It made me yearn to explore them but my husband would not have been game for that! LOL He’s such a buzz kill sometimes! What fun little treasures. The tricycle is so cute. I love the Vintage Soul sign. Happy New Year! Happy new year to one of my favorite creative geniuses! Ooooooh, great finds Angie. 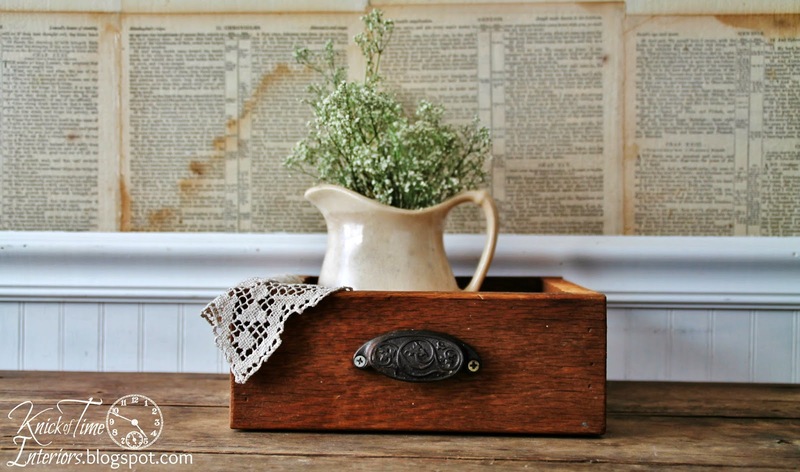 I love those vintage dust pans and those little drawers are such a great idea for creating vignettes around the house. 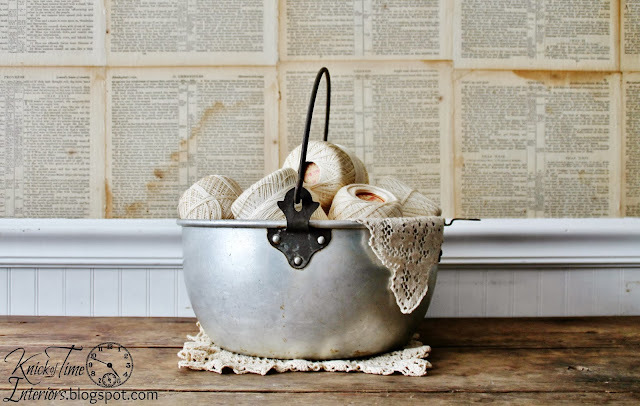 I can’t wait to hit our local thrift stores in January for new creative inspiration. Wishing you a Happy New Year!